As he was rapping on the April 2016 “Tameness of the Wolf” episode for the FOX TV series, Empire, the Hakeem Lyons character reminded me of writer Toni Cade Bambara's call for another black arts movement (BAM). I don’t recall where Bambara made the remark, I just remember thinking that it was too soon to repeat that particular phase in our cultural evolution. But when Hakeem rapped, "Just cause I'm light skin and curly hair….” in an early scene in the program, I was ready to say "amen" to Bambara’s remark. The black arts movement was a reality check to the “leaning to the light” tendencies of African Americans long denigrated for their African traits — the leaning that privileges the non-black aspects of our physical appearance over the African aspects. 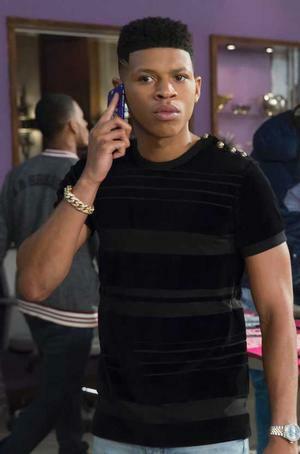 In the broad spectrum of African American complexions, Bryshere Gray who plays Hakeem, is in the broad, mid-range which includes coffee and cream — not “cream,” i.e. “light skin." Gray’s "curls" come by way of that curl sponge that will only “take” on coily (i.e., "nappy") hair. And his physiognomy has a strong African cast. 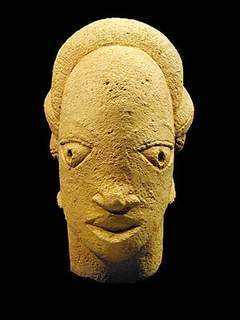 Bryshere Gray’s visage reminds me of the beautifully expressive qualities of Nok sculpture. 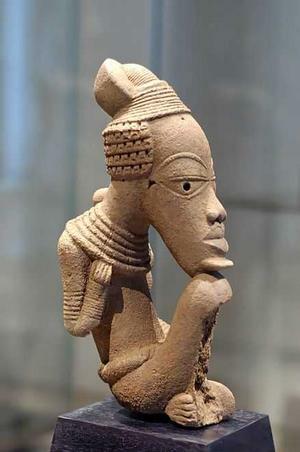 Dating from about 1,000 BCE to 300 CE, the Nok people of Nigeria produced terra cotta sculpture as part of a culture that also developed smelting, forging and complex social systems. Because the phenotypes of African features are many and the mixing of enslaved African peoples in the U.S. has been extensive, it's a marvelous revelation when we can identify elements of our features that are characteristic of specific African ethnic groups. In the black arts movement of the late 1960s and 70s, connections were between African American and African peoples and cultures enabled black people to make worldy associations and not to just “lean to the light” by default. And that’s why Hakeem’s light skin/curly hair conceits prompted my delayed amen to Bambara’s remark. A qualified amen. We don’t need another black arts movement for African Americans working in influential mass media and, indeed, all African Americans, to consider the vast range of African American physical appearance in broadly commensurate contexts. But a broader inspiration from multicultural visual influences would benefit the Empire staff and other similar popular media powers. 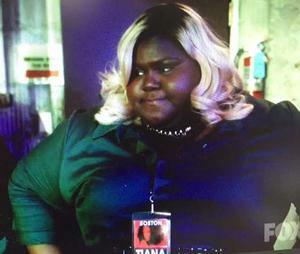 For example, the evolution of “Becky," Gabourey Sidibe's character could benefit from such worldinness. Becky’s chic attire and blond hair shows that conventional glam and playful hair color is not the sole province of slimmer, fairer-skinned women. 10-4! Got it! Becky carries that persona with sweet alacrity. A. London-based fashion designer Duro Olowu basing his spring 2015 collection on the people, crafts and ambiance of one of his favorite places — the seaside Senegal town of Saint-Louis. B. The young Senegalese fashion designer Adama Ndiaye who has lived and traveled around the world and is now based in Dakar. Her company, Adama Paris, creates internationally eclectic design. C. The stylish people and rich visual and crafts culture of Senegal's neighbor, Mali, where people also named Sidibe live. 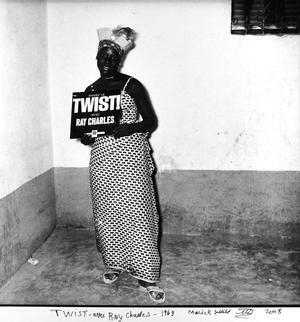 If the Senegalese and Malian Sibibes were all one people before colonial boundaries were drawn, then Gabourey Sidibe's peeps include Malik Sidibé (1935-2016), the Malian photographer internationally known for his black-and-white studies of the fashion-conscious people, pastimes and celebratory moments of Bamako, his home town, in the 1960s and '70s. While today's photography can more reliably show the nuances of the features of deep brown complexioned people, the intensity of skin tones in Sidibé's photography is none-the-less striking. The “Tameness of the Wolf” episode with Hakeem's leaning to the light rap aired on April 13, one day before Malick Sidibé died. Cultural appropriation is culturally healthy when the influence goes both ways with some of the distinctive qualities of one's own background being maintained. Sidibé's most well-known photograph is of a young couple in western dress dancing but the young woman has a traditional hairstyle, is bare foot and both show the African contributions to popular dance in the West. In his black and white photography Seydou Keïta (1921-2001) also captured Bamako artistry and flair, including magnificently tie-dyed fabrics, creative fashion design and sculptural hair styles. The exhibition, Seydou Keïta, is on view March 31 – July 11, 2016, Grand Palais in Paris. The exhibition is organised by the Réunion des Musées Nationaux – Grand Palais in partnership with the Contemporary African Art Collection (CAAC) – The Pigozzi Collection. 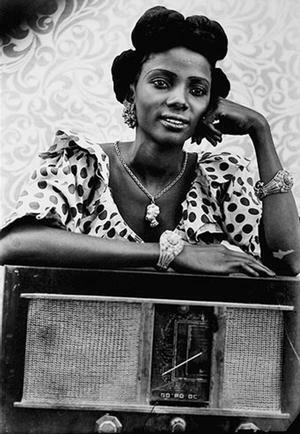 Patterns against patterns: Keïta often photographed his women subjects wearing patterned dresses against fabric backdrops with decorative patterns. Many of Nigerian born Duro Olowu's designs show how clashing patterns and colors can be combined to harmonize in smashing ways. The personal persona of Studio Museum in Harlem director Thelma Golden, and spouse of Duro Olowu — she often wears his designs — is a superb example of leaning in multiple directions: African, international; traditional, contemporary. 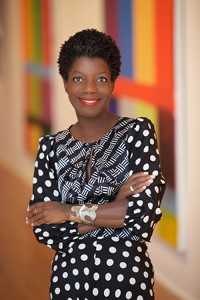 By the way, on April 6, 2016 Thelma Golden received Bard College's 2016 Audrey Irmas Award for Curatorial Excellence given with a prize of $25,000 at the CCS Bard Gala Celebration in New York. In addition to the bodacious plot twists, the popularity of Empire owes to its sensory appeal: lots of music, glitz and glam — conventional gliz and glam. Hey Empire producer/director Lee Daniels, we feel your love for all who pull themselves up from poverty with grit and verve but, as the show progresses, maybe consider a broader array contexts in delineating the personas of your characters? Physical desirability is not just a matter of leaning mostly towards the light. Related IRAA+ article: Making Song of Art about vinyl artist Walter Lobyn Hamilton whose works appeared on an Empire set during the show's first season.